The Breyers $1/2 coupon has reset for some people. Be sure to check Coupons.com to print more if you already printed two previously. You can still get free pints of ice cream at Albertsons until Tuesday using the coupon. 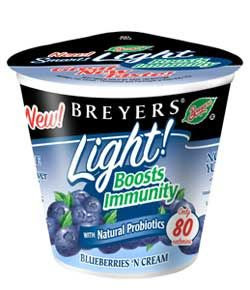 You can also use these coupons on Breyers yogurt — does anyone know of a store that carries Breyers yogurt? Ronda-I used a $2/3 and a $4/5 cat yesterday on my breyers with no problem. The ones on sale are 16 oz. or 2 cups and they say 4 servings on them. I had an extremely picky clerk yesterday and I am sure that she would have made sure that I didn't buy them. She wouldn't let me double my $1/1 breyers coupon. The $4 CAT excludes individual servings. I agree with Kristen, I tried to go to the Alberston in Beaverton and they were sold out too! Ok, who bought all the ice cream in Hillsboro? I had to get a RC! My wal mart has the yogurt. They have Breyers yogurt at Albertsons (or at least the one on BVT Hillsdale)…and its on sale for $.67 each! If your coupons didn't reload not to worry, you can still print 2 more at http://www.klondikecoupon.com !!! WOO HOO! Nearly fogot：I got the catalina from Albertsons. If you get 4 at one transaction, there will be a catalina printed: save $4 when you buy 5 breyers ice cream. The expiration of the catalina is 10/15/2009. I just found $1/1 breyers ice cream pint (16 oz.) at a circle K in Sherwood. It was on the front of the freezer door. I never go into circle K's so it was just a random stop and I looked over and saw them. I don't know if all circle K's have them but just thought I would let everyone know. Lately I have been getting surveys on my receipts…they are like a little $2 coupon for a few minutes of my time! I used that with a Wisk $1/1 coupon and doubled that…got laundry detergent for $0.49!